Thousands of students over many decades remove any doubt. Even at a tender 4 years old (or even earlier), kids can almost miraculously play a string instrument with beautiful posture and a rich, vibrant tone. So just what is the ideal age to begin violin lessons? Over many years of teaching today’s super-busy Suzuki families, I’ve found the common bond between the most successful is a long standing, deep and abiding love of music. This is the one ingredient that seems to motivate kids to stick with the program over the long haul. Let’s face it; learning to master a musical instrument is a long term project. The rewards are great; if you are willing to make a family commitment to the see it through. • Especially for younger students: a parent who will be physically and mentally present for all lessons and practice sessions, who will take careful notes, and who will be support the practice process, no matter what is required. What’s a good starting age for kids? Taking the above factors into account, I’ve found that it is rare to find a modern family that can find the time to fully support a 3-4 year old Suzuki violin student. Still, a few super patient parents will find themselves with an unusually well-focussed four year old and the results look almost magical to someone on the outside. 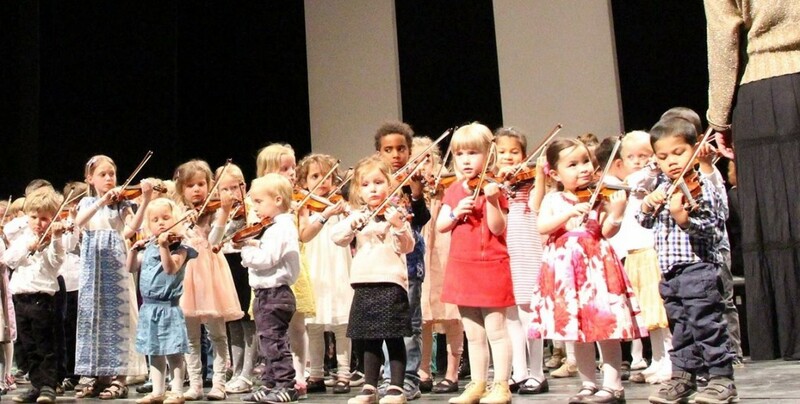 If you have a five or six year old child and as a parent you’re willing to learn more than your ever dreamed of about the violin, success will almost surely be yours! Even 7-12 is an ideal age to begin violin lessons. I’ve successfully started beginners at every stage of life. And I’ve rekindled violin journeys for many an adult whose instrument has been gathering dust in a closet for decades. As an adult student, you have many unique advantages, and you have the ability to leapfrog your progress very quickly, if you so desire. The short answer: there is no “ideal” age to being violin lessons when you bring your curiosity, your patience, your love of music and a youthful can-do spirit to your violin journey.